Millions suffered during the Great Depression. Starting with the stock market crash on October 24, 1929, and continuing to drop until the market hit bottom on July 7, 1932. The crash set in motion a powerful mindset that still exists today as to how people invest their monies. Total disarray enveloped the world during the decade of the 30’s and the basic needs of humanity experienced a rebirth. In 1933, the unemployment rate reached it's worst when it soared to 25%. With the suffering of millions, Americans rediscovered the virtues of our principles as a country and the essential decency of the ordinary citizen. This discovery inspired a whole new generation of growth, expansion and direction for MLM. Frank Stanley Beveridge and Catherine L. O’Brien founded Stanley Home Products. 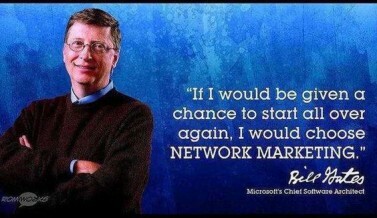 The new direct selling company offered an opportunity for people to start their own business with a small investment. Those that were suffering economic hardships was a big factor and in 1931 their vision became a reality as people began to sell Stanley Home Products door to door offering very high quality household products. The Encyclopedia Britannica has been published continuously since 1768. Since the early 1930s, the Britannica has developed several "spin-off" products to leverage its reputation as a reliable reference work and educational tool. And in recent years, digital versions of the Britannica have been developed. The 1903 advertising campaign for the tenth edition was an onslaught of direct marketing. The advertising was clearly targeted at middle and lower-middle-class people seeking to improve themselves. In 1889 the W.T. Rawleigh Company was established by William Thomas Rawleigh. This company sold a wide variety of household products and was sold by mail-order and by traveling salesmen. Using the direct sales approach through a magnitude of door to door salesmen to build their business, the height of popularity of this company and its products appears to have been during the 20s, 30s and 1940s. The Rawleigh Company advertised their scientific practices to deliver quality ingredients to their customers. At the age of 17, Rawleigh’s observation of men who called at his home selling farm medicines awakened him into the realization of the potential involved in this type of operation. Rawleigh was a forerunner of the “direct-to-customer” approach. This method certainly worked; by 1920 Rawleigh had more than 22 million customers. Then as now, you won’t find Rawleigh products in any store. Watkins Incorporated in 1868, originating as a rural business. By the 1920’s demand was clearly growing beyond farming communities for J.R. Watkins’ natural concoctions and he expanded his reach into the urban centers. Watcher’s Organic Sea Products Corporation, founded in 1932, adopted a multi-level compensation plan some time during the 1930's to 1940's. It is commonly believed that Watcher's is the oldest, continually operating, privately held network marketing company in the world. These are just a few MLM’s that shaped and helped the common man during the Depression years. They not only put people to work, but also offered quality products at a reasonable price to their customers. Most of these companies today are remembered with gratitude and with a reverence for the yesteryear's. These companies answered and delivered the call to create a way for the common man to have the means of a respectable way to earn a living, while the manufacturing segment of our country lay dormant. They also opened doors for women to become an important part of history as they became instrumental in our economic recovery. On the next post we look at MLM during the recovery period of the Great Depression and afterwards. work after the Great Depression may surprise you.